When Arturia first announced what would be its new AudioFuse mobile recording interface as a part of NAMM 2015, heads turned and users were ready to jump on it immediately. However, the product did not end up becoming available for purchase until the summer of 2017 — which ended up being a big let down for a lot of people who had expected something much sooner. For NAMM 2019, however, it seems as though it has learned from its mistakes. Arturia quickly hit the showcase floor this year and introduced two brand new members of the AudioFuse interface family: The Arturia AudioFuse Studio, and the Arturia AudioFuse 8Pre. This desktop interface starts directly where Arturia left off with the AudioFuse two years ago. It serves as an extremely flexible 18-input, 20-output compact and portable recording station, making it perfect for engineers who tend to do a lot of location or field recording sessions. It features four combo mic/line/instrument inputs at the front of the interface which also contain 4 Discrete Pro preamps. Around the back are a combination of line, ADAT, S/PDIF and MIDI inputs and outputs. Like the original AudioFuse interface, it also sports a big volume control knob off to the right hand side, two headphone outputs with volume controls, and a talkback button. It’s here where you’ll also find that Arturia is the latest company in line to embrace USB-C connectivity. The Arturia AudioFuse Studio has a set price of $999, and will become available online and in stores this Spring. In the meantime, to learn more, head over to its product page on Arturia’s website where they have a full description of the many features it provides. 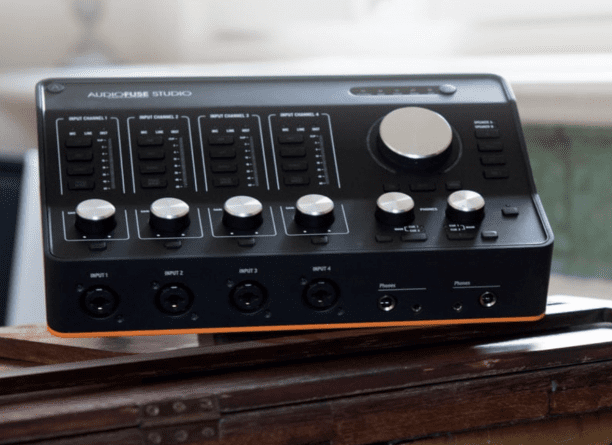 The Arturia AudioFuse 8Pre is the first rack-mountable unit in the AudioFuse product range. It features a series of eight Discrete Pro mic preamps on the face, which correlate to its total of eight combo inputs. The front of the interface also features a main output volume control, headphone control, as well as selection indicators for the connected word clock sample rate, sync, and mode. 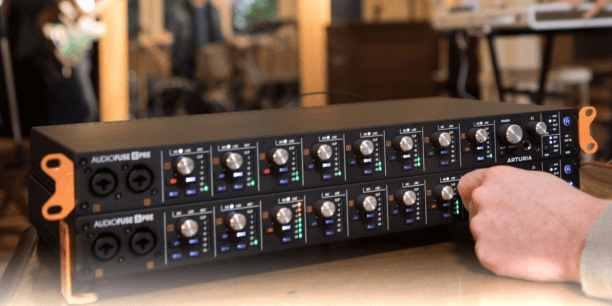 Around the back, like the AudioFuse Studio, you will find a combination of different line, ADAT, S/PDIF and MIDI inputs and outputs, as well as that handy little USB-C connector. The AudioFuse 8Pre will also be dropping sometime this Spring, at which point you’ll be able to grab it for a price of $799. Until then, a fully detailed walkthrough of the Arturia AudioFuse 8Pre can be found on it’s product page.